Waste Bin Capacity: 11.9 gal. The Intimus 45CC4 is a safe and nearly silent micro cut shredder, designed for two to four users. This multi functional shredder destroys paper, cds, dvds, floppy disks, staples, paper clips and credit cards. The 45CC4 can shred up to 9 sheets at once into 5/64" x 19/32" security level 4 micro cut pieces. Jams are easily prevented with the Dynamic Load Sensor, but if a jam does occur, it has an integrated auto reverse function for easy removal of jammed paper. The 45CC4 is user friendly thanks to the i-control function control, 2 x 2 cut and collect system for separate digital media waste, Silentec innovative sound dampening principle, and EcoLogic for greater energy efficiency. Cutting speed 70 g/m²: 16 ft./min. Cutting speed 70 g/m²: 210 sheets/min. Cutting speeed 80 g/m²: 178 sheets/min. The 45CC4 is a micro-cut shredder than offers level 4 security. Level 4 machines provide users with a very high amount of security so you can protect Social Security numbers, banking information, and other sensitive data. The machine produces bits that measure just 5/64" x 19/32". This shredder can shred up to 9 sheets at a time. While this may not seem like a very high shredding capacity, it's very typical for a micro-cut machine. That's because the blades need to work twice as hard to destroy the paper. The 45CC4 is strong enough to destroy documents that still have paper clips and staples attached to them. It can also destroy some plastic items such as credit cards, floppy disks, DVD's, and CD's. This will be very helpful if you need to get rid of multimedia items on a daily basis. 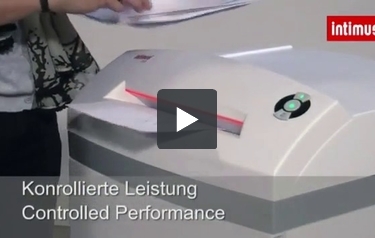 You won't be dealing with very many paper jams because this machine has a Dynamic Load Sensor. The sensor will alert you when you're trying to shred too much, so you'll have a chance to remove the extra sheets. If a jam ever does occur, be sure to take advantage of the machine's auto reverse function. The 45CC4 doesn't make a lot of noise because it has a Silentec feature. Thus, you will be able to shred without annoying your co-workers. Also, you will find this machine easy to use because it has an iControl user panel. It's right of the top of the device. This device has a 12-gallon waste bin so you'll be able to share it with a couple of co-workers. The machine's 2 x 2 feature will keep paper and plastic bits separate so recycling will be a snap. The 45CC4 isn't very big. Its approximate dimensions are 17" x 15" x 26" so you might be able to keep it under your desk. There are rollers on the bottom of the machine so it can be moved around easily. Finally, this shredder has an EcoLogic system to conserve energy and keep things running smoothly. Final rating: 9. Overall, we are very impressed with the Intimus 45CC4 micro-cut shredder and it's highly recommended. This machine will give you the security you need, especially since it can shred both paper and multimedia items. The 45CC4 has a lot of great features, such as the Dynamic Load Sensor and the iControl user panel. Plus, the machine has a 12-gallon waste bin so it's good for some shared use even through it's not very big. If the 45CC4 sounds like the right shredder for you, be sure to take a look at it today. You will be glad you did.